Jocelyn Bongorno began caring for others when she was a teenager. When she was a student pursuing an Occupational Therapy Assistant program (OTA) degree from Owens Community College in September 2014, she unexpectedly learned she would need to be on the receiving end of healthcare services. She was diagnosed with Hodgkin’s Lymphoma stage 3 cancer. “The doctor comes in and says that ‘C’ word. You think, ‘Cancer, I’m 28 years old?’ Every single day I’m so glad I’m here and that I get to do what I do,” said Bongorno, 32 and now fully recovered. The 2017 Owens graduate is employed as a certified OTA for Mercy Health – Children’s Hospital Autism Services in Maumee, where she works with children with autism and their families. Her interest in healthcare started during her childhood growing up in North Baltimore, where her family included aunts that worked as nurses. When she was in high school, her grandfather was diagnosed with brain cancer, non-Hodgkin’s Lymphoma. She helped with his care and also studied professional caregivers as they came to his home. A year after graduating high school, Bongorno earned her state-tested nurse assistant (STNA) certification at Owens and began working as an STNA at St. Catherine’s Manor of Findlay and then Manor of Perrysburg, a career that spanned 2007-2016. That led her back to Owens and the School of Nursing and Health Professions, which offers more than 20 in-demand programs, leading to careers as OTAs as well as nurses, medical assistants, personal trainers, dental assistants, dental hygienists, radiographers, medical coders, surgical technician technologists, MRI technologists, sonographers and physical therapist assistants. Owens graduates are making a difference locally, said Cathy Ford, Dean of the School of Nursing and Health Professions. 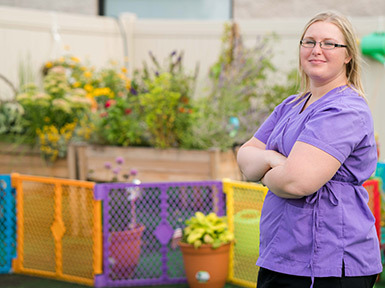 Bongorno, a Sylvania resident, wanted to find work in an oncology OTA setting after graduating because of her bout with cancer until she worked her final clinical at Mercy Health – Children’s Hospital Autism Services. She fell in love with pediatric care. The feeling for her was mutual from Mercy Health, which created a position for her immediately after she graduated. At the site, she has designed a sensory garden featuring the senses of taste, touch, sight and smell. She hopes to expand it in the next year.